This Baby Basket is excellent for: A baby shower gift. A newborn baby gift. A first birthday gift: Grrreat baby gift baskets are our specialty. 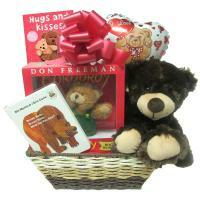 This extra soft and plush new gift basket includes some of our adorable animals for baby to snuggle and cuddle with. Whether mom and dad keep them in the crib, in the toy chest, or off in the stroller baby will love the new Animals Basket. . Includes: . - Plush Bear, Giraffe, and Elephant. These three are a great gift for a new baby or small child that will long be their favorite lovey stuffed animal. Embroidered eyes to avoid a hazzard. Approx. 10 inches in height. All infant safe and machine washable. GoToBaby's Set/2 extra thick, beautiful, 100% cotton diaper burp cloths are perfect for a baby shower, newborn baby gift or first birthday gift. Finger Puppet Book which is great to teach as well as entertain baby. Baby Print Tin to capture any new babies hand or footprint. . As always our baskets come in a great baby gift basket that is perfect for decoration and storage in the nursery! The All New Crinkle Basket is a new take on our old classic with many happy customers: * The fun loving plush Crinkle Vibrating Caterpillar. When it is extended watch the body shimmer back to its original position. It is also great fun when attached to a baby carriage and entertains the little one. * A Rainbow maker that creates a rainbow as the beads cascade when shaken and spun around. This appeals to babies and children up to 3 years old. Another wonderful playful toy. * A beautiful baby print maker to capture the little hands or feet of the precious baby or child. * GoToBaby's set/2 extra thick, beautiful, 100% cotton diaper burp cloths are perfect for a baby shower, newborn baby gift or first birthday gift. * Gotobaby's wicker basket shaped like a bassinet which is great for decoration and storage. This Baby Basket is excellent for: A baby shower gift. A newborn baby gift: The JUNIOR basket has great treats for Mom, Dad & Baby! ¨Ô GoToBaby's Set/2 extra thick, beautiful, 100% cotton diaper burp cloths are perfect for a baby shower, newborn baby gift or first birthday gift, choice of color for a boy, girl, or neutral: ¨Ô The fun loving plush Crinkle Vibrating Caterpillar. When it is extended watch the body shimmer back to its original position. It is also great fun when attached to a baby carriage and entertains the little one: ¨Ô Burt's Bees Baby starter kit with fantastic luxuries like baby buttermilk lotion, baby bee shampoo bar, apricot baby oil, diaper ointment and more! ¨Ô Mom and Dad get treats as well!! Our Delicious Hot Fudge Sundae Mix for 2: Cone filled with hot fudge mix, imported white and semi-sweet chocolate chips and mini marshmallows. Enough mix for special friends to enjoy together to celebrate any occasion especially the birth of a new baby! ¨Ô 9" Ty Cuddly Super Soft My First Teddy Bear that every new baby needs as their newest companion: *As always, our gift baskets come in GoToBaby bassinets that are great for decoration and all sorts of fun things: Select "Gift-wrap" at checkout to have your basket wrapped in cellophane and beautiful bows and ribbons. This Baby Basket is excellent for: A baby shower gift. 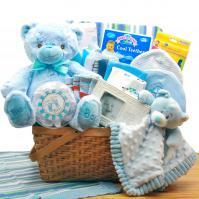 A newborn baby gift: The Mary Jane Baby Gift Basket is excellent for: A baby shower gift. A newborn baby gift. The Mary Jane Basket comes with: A set/6 Mary Jane socks sized for a girl 0-12 months. They come in there own pretty gift box and are adorable. GoToBaby's Set/2 extra thick Pink, beautiful, 100% cotton diaper burp cloths are perfect for a baby shower, newborn baby gift or first birthday gift. A Baby Starter Set of Burt's Bees fantastic luxuries like baby buttermilk lotion, baby bee shampoo bar, apricot baby oil, diaper ointment and other goodies! The fun loving plush Crinkle Vibrating Caterpillar. When it is extended watch the body shimmer back to its original position. It is also great fun when attached to a baby carriage and entertains the little one. Baby print maker which takes an imprint of baby's foot or hand and is tons of fun. This Baby Basket is excellent for: A newborn baby gift. A first birthday gift. The blue or pink robe gets embroidered with the baby's initials. A satin trim and backed baby blanket of matching color. GoToBaby's Set/2 extra thick, beautiful, 100% cotton diaper burp cloths are perfect for a baby shower, newborn baby gift or first birthday gift. For gift card please type gift message in the comment section during checkout! This Baby Basket is excellent for: A baby shower gift. A newborn baby gift: The TWINS New Duds Basket will. dress up the little ones with some stylish starters: This basket includes two Asian designed 2 Piece Tea outfits sets in either pink or blue trim. These outfits look adorable on any baby and give them a chance to come out. looking their best! Also included are a set of beautiful burp cloths: Select "Gift Wrap" during checkout for cellophane, ribbon and bows. special gift wrapping: For gift card, please type gift message in comment section during check out.